Camberwell and Peckham: support our socialist candidate! Bangladeshi textile workers: "They won't keep us quiet"
Who speaks for Jewish people in Britain? Lecturers strike to tell colleges: pay up! We need democracy in the Palestinian solidarity movement! 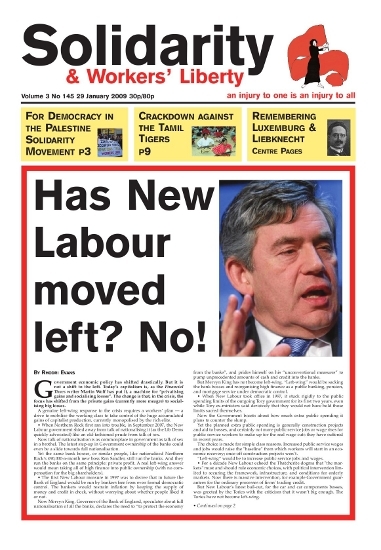 Has New Labour moved left? For two states and workers' unity! On Thursday 29 January, all of France’s main trade unions will participate in a general strike. The strike is also backed by the (‘social-liberal’ opposition) Socialist Party and has the overwhelming support of the public, according to polls. When is a resignation not a resignation? Well, in politics of course. We know from bourgeois politics that disgraced politicians — even those exposed, bruised and publicly humiliated to the extent of Peter Mandelson — can make dramatic comebacks. About 60 people, mostly young, crammed into a Green Park social centre on 15 January for a forum on the war in Gaza held jointly by Workers' Liberty and the Worker-communist Party of Iraq. Workers’ Liberty member Jill Mountford will be standing in the south east London seat of Camberwell and Peckham at the next general election — against New Labour deputy leader and cabinet minister Harriet Harman. In the midst of a recession which for working-class people means job losses, wage cuts and repossessions, the need for working-class socialist candidates to take the class struggle into elections and into Parliament could not be more obvious. Students at nearly 20 universities across the UK have staged occupations in protest at Israel’s war on Gaza. Some, such as LSE and Essex, have already ended successfully, with key demands (such as official university statements of condemnation of the war and support for scholarships for Palestinian students) being met by university management. Others, such as Sussex and Cambridge, are ongoing at the time of writing. Although Slumdog Millionaire has generally received very good reviews it has also had its fair share of critics. Some of the criticism may be worth consideration. For instance: that it is an “outsider's” view of India, that the political movement against poverty in Indian city slums should have been shown, that the film’s child actors have not been adequately helped. For most Tamils in the world today, the events of the last month have been devastating but they must also have been expected. Maybe 300 Tamils have been killed in the last few days [28 January] by Sri Lankan army shelling; 300,000 civilians are trapped in a full-scale warzone being denied the right to leave by the Tigers or genuine safe passage and humanitarian aid by the Sri Lankan government. Zimbabwe teachers plan strike; Botswana mineworkers seek reinstatement; migrant workers strike in Hong Kong. The inauguration of Barack Obama, the first black president of the United States of America, is a source of intense hope for a great many American workers. More people than ever before, including more people from Afro-American and Latino backgrounds, turned out to vote for Obama in the November 2008 elections.